The Format tab contains different options for selecting output formats and other reporting features, depending on whether you are creating a report or a chart. For reports, the Format tab provides access to the Output Types, Destination, Navigation, and Features groups, as shown in the following image. For charts, the Format tab provides access to the Output Types, Destination, Chart Types, Features, and Labels groups, as shown in the following image. If HTML5 is selected as the Output Type, the Lightweight Mapping feature is enabled in the Chart Types group. This also gives you access to the Interactive Options that are available for HTML5. The Output Types group contains commands to create output in any of the supported formats listed in the following table. When you run a report, the output is created in the format that is currently selected. You can also set output format options by going to the Home tab, and in the Format group, selecting from the menu of output options. In addition, you can select an output from the output format button in the status bar. For more information on the additional Excel formats available for reports, see Report Outputs. The output types of PNG, GIF, JPEG, and SVG do not appear in the Output Types group, by default. In addition, User Selection is not available, by default. You can enable these options by opening the Administration Console, selecting Utilities, and then InfoAssist Properties. When opening an existing procedure with JPEG, GIF, or SVG, a warning message opens, indicating that the request is not allowed with the current configuration and that the procedure will be converted to HTML output. When opening an existing procedure with PDF or GIF, a warning message opens, stating that the request is not allowed with the current configuration and that the procedure will be converted to PDF output. When you run a report, the output is created in the format that is currently selected. You can also set output format options from the output format button in the status bar. The User Selection output format allows you to change the output type of your report at run time. User Selection can be accessed from the Output Types group on the Format tab, as shown in the following image. Once it is enabled, you are prompted, at run time, to select an output type. This is shown in the following image. For reports, you can select HTML, active report, active Flash, PDF, active PDF, Excel (xlsx), Excel Formula (xlsx), and PowerPoint (pptx). For charts, you can select HTML, HTML5, active report, active Flash, PDF, active PDF, Excel (xlsx), and PowerPoint (pptx). For documents and dashboards, you can select HTML, active report, active Flash, PDF, active PDF, Excel (xlsx), and PowerPoint (pptx). The Destination group contains commands to create an InfoMini application, an image file for a chart, a data file for a report, or a HOLD file. When a chart is selected, clicking the File button or selecting Select a location and format from the File drop-down menu, opens the Select a location and format dialog box, as shown in the following image. Note: The label Temporary appears at the top of the dialog box. When you select a folder, the label changes to Select a location and format, as shown in the following image. In the Select a location and format dialog box, you are able to name the file and select the output type. The available output types are PNG, GIF, SVG, and JPEG. In order to create the image file, you need to execute the procedure. Note: The File button is not available in InfoAssist Basic. InfoMini. Enables the creation of an InfoMini application. For more information on using InfoMini, see Building InfoMini Applications. Note: InfoMini is not available in InfoAssist Basic. Report. Makes report-specific functionality available in InfoAssist. If you switch from Report to Chart all selected options specific to each type of report are maintained during the current session until you save the report. When you save a report, chart-specific options are not maintained. Note: The Report to Chart, or Chart to Report conversion options are not available in InfoAssist Basic. Chart. Makes chart-specific functionality available in InfoAssist. If you switch from Chart to Report all selected options specific to each type of chart are maintained during the current session until you save the chart. When you save a chart, report-specific options are not maintained. Note: The Report to Chart or Chart to Report conversion options are not available in InfoAssist Basic. The Navigation group contains commands to customize output display and navigation. Note: You can only choose one option from this group. Table. Generates standard browser output. This is the default. Table of Contents. Generates output by displaying a table of contents icon in the upper-left corner where report output typically appears. Clicking Table of Contents opens a menu that enables you to select (view) individual values of the first Sort By (By) field, one value at a time. You can also select options to view the entire report or remove the table of contents. For more information, see How to Create Table of Contents Reports. The Table of Contents option is activated only when HTML, active report, Excel, or PowerPoint output format is selected. You cannot use the Table of Contents option with the Accordion feature. For more information, see How to Create Accordion Reports. Freeze. Generates output with column titles that freeze (remain in view) when you scroll through pages of the report output. For more information, see How to Freeze Column Titles in Reports. Pages On Demand. Provides access to two distinct features depending upon the output type that you have selected. HTML. If you select this output type, and click Pages on Demand, then the report opens in the WebFOCUS Viewer. For more information on the WebFOCUS Viewer and its menu bar options, see Creating Customized Report Outputs. active report. If you select this output type, and click Pages on Demand, then active cache is enabled. For more information on active cache, see Using the Active Cache Option. Auto Drill & Analysis. Generates output which invokes OLAP processing. For more information, see How to Create OLAP Reports. The OLAP option is activated only when HTML output format is selected. The Features group for reports contains commands to select specialized reporting features. Title Popup. Displays pop-up titles when the mouse pointer hovers over a column title in the report output. For more information, see How to Add Pop-Up Titles to a Report. Accordion. Creates expandable views of data for each vertical sort field. This option displays data values only for the first vertical sort field when you first view the output. You can manually expand your view to expose the data values of lower-level sort fields. For more information, see How to Create Accordion Reports. Note: You cannot use the Table of Contents with the Accordion feature. For more information, see Navigation Group (Reports Only) . Repeat Sort Value. Displays all repeated sort values instead of blanks in the output after the first instance of a new sort value, which is the default behavior. Stack Measures. Displays all numeric measure field names in a column of the report output with the corresponding numeric data values. For more information, see How to Implement Stack Measures. For more information on Stacked Measures, see the Stacking Columns topic in the Creating Reports With WebFOCUS Language manual. active report options. Opens the active report options dialog box where you can configure your active report options such as menu items, graph engine, and colors. For more information, see Creating an Active Technologies Report. Accessibility. Allows a title to be added to a report, chart, or document that is Section 508-compliant. The following table lists the output for which each feature is available. Yes means the output is available for the feature. No means that the output is not available for the feature. The Features group for charts contains commands to select custom chart features. 3D Effect. Sets the three-dimensional view to on or off. The 3D Effect feature is disabled for 3D, stock, gauge, gauge thermometer, Pareto, spectral map, and funnel chart types. This is the default. Rotate. Toggles between a vertical display or horizontal display of a chart. For more information, see How to Rotate a Chart. The Rotate feature is disabled for pie, scatter, 3D, stock, gauge, gauge thermometer, Pareto, spectral map, and funnel chart types. Reference. Opens a drop-down menu that provides the Add Reference Line to Y-Axis and Add Reference Line to X-Axis options. Selecting one of these options opens the appropriate Reference Line dialog box, where you can set the specific X-axis or Y-axis value, type the text that you want, and position the reference line on a chart. For more information, see How to Display a Static Reference Line. The Reference feature is disabled for pie, 3D, stock, gauge, gauge thermometer, Pareto, spectral map, and funnel chart types. Note: The reference line option is not available in InfoAssist Basic. Annotate. Opens a drop-down menu that provides the Add an annotation option. Selecting this option opens the Annotation dialog box, where you can type the text that you want and position the annotation on a chart. For more information, see How to Display Annotations. Note: The annotation option is not available in HTML5. The annotation option is not available in InfoAssist Basic. Grid. Opens a drop-down menu allowing you to expand options for Horizontal or Vertical Gridlines. Both selections allow you to enable or disable Major and Minor Gridlines. Clicking More Options opens the Format Grid Lines dialog box. For more information, see Formatting Gridlines. Frame & Background. Opens the Frame & Background dialog box where you can edit the background style and frames for charts. The dialog contains different options depending on the chart type selected. For more information, see Formatting a Frame and a Background. Gauges. Opens the Gauge dialog box where you can edit your gauge chart. This button is only available when a gauge chart type is selected. For more information, see How to Style a Gauge Needle. Note: Gauge options are not available in InfoAssist Basic. active report Options. Opens the active report options dialog box where you can configure your active report options, such as menu items, graph engine, and colors. This button is available when the output type is set to active report, active Flash, or active PDF. Note: Annotate is not available in HTML5. Accessibility. Allows a title to be added to a report, chart, or document that is Section 508 compliant. This option is only available for reports and charts when the output type is HTML or PDF. For documents, the output type must be set to PDF. Note: The chart features are unavailable when designing a chart that will be output in active report, active Flash, or active PDF formats. The Chart Types group contains the most commonly used chart types, including Bar (default), Pie, Line, Area, and Scatter. You also have access to Lightweight Mapping, provided that HTML5 is selected as the output type. Click Other to open the Select a chart dialog box, as shown in the following image. The chart types, depicted by icons, display on the left side of the dialog box. The first chart type represents the bar chart category, which is selected by default. When a chart type is selected, the dialog box displays thumbnail images of bar chart variations that are supported. In this example, the Vertical Percent Bar chart type is selected. A description of the selected chart type is provided beneath the images. For more information on the chart types that you can choose from, see Selecting a Chart. The Labels group for charts contains the Axes and Legend drop-down menus. Axes. Opens a drop-down menu, where you can enable and rotate horizontal and vertical axis labels, and stagger horizontal axis labels. You can also edit the axis labels by clicking More Horizontal Axis Options or More Vertical Axis Options. For more information, see Formatting Axis Labels. Note: The Axes option to change the position of data labels is not available in InfoAssist Basic. Legend. Opens a drop-down menu, where you can select the Show Legend option to display the legend on the chart, or clear your selection to hide the legend, change the default legend position, and change the default legend orientation. For more information, see Format Legend Dialog Box. The Interactive group contains the Interactive Options button, which enables you to access the interactive options that are available for charts in InfoAssist. Note: The Interactive group is enabled only when the HTML5 output format is selected. When you click Interactive Options, the Interactive Options dialog box displays, as shown in the following image. 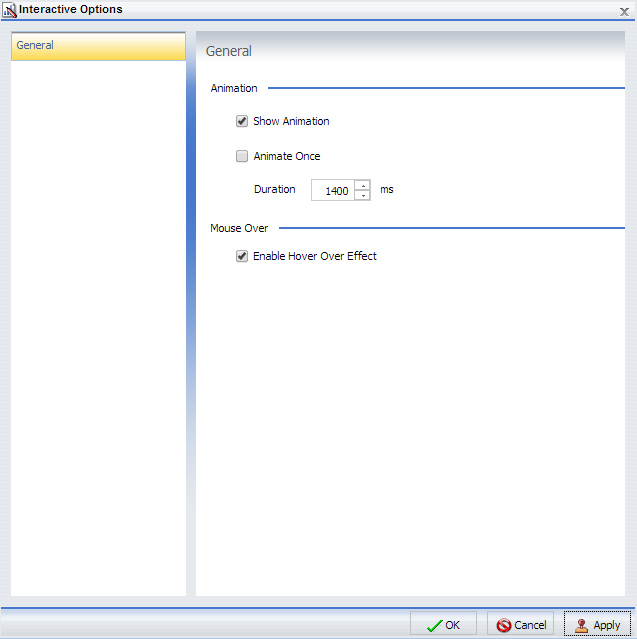 The Interactive Options dialog box enables you to specify animation and mouse over effects in your chart. Show Animation. Enables you to specify options for animation in your chart. Clear this check box to disable animation. This option is selected by default. Note: If the Show Animation check box is cleared, the option to Animate Once is not available. Animate Once. Enables you to specify the frequency of chart animation. Select this check box to indicate that the chart should be drawn the first time a procedure is executed, but not on subsequent executions of that procedure. If this check box is not selected, the chart will animate every time the chart is redrawn. Duration. Defines the duration of the animation in milliseconds. You can manually enter a millisecond value (ms) or use the arrows to adjust the default value, which is 1400. This value may vary depending on the theme that you select. Note: When specifying a duration for an animation, larger numbers produce slower animation. Enable Hover Over Effect. Controls the display of the mouse over indicator, which shows chart component information when you hover your mouse over an object. This option is selected by default. However, settings in your theme may override this setting.